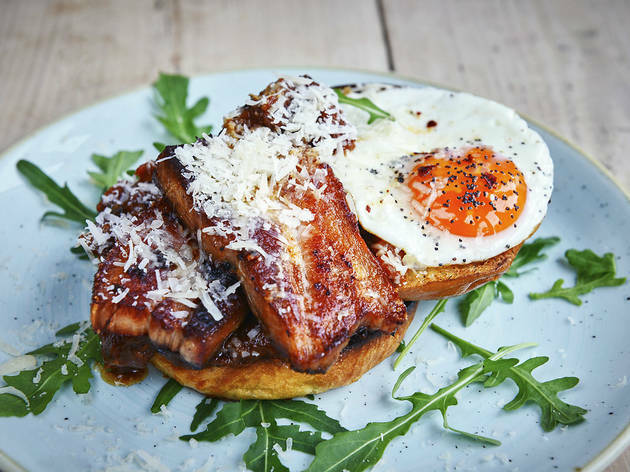 Balham brunch spot from a trio of twenty-something schoolfriends. What a difference a day makes. Or, in the case of Brother Marcus, four days. On April 17, the twenty-something trio behind this new Balham hangout picked up the keys from previous owners The Chestnut (a well-meaning but old-fashioned caff); by April 21 they were open. In that time they’d painted the sign, built the tables, taken the press shots. They didn’t pay a penny to another person (‘we couldn’t have even if we’d wanted to’, one comments, ‘we didn’t have any money’). Turns out the founders – all friends from school – are a multi-talented lot. When not front of house, Alex Large, who spent a summer with street vendors Stake Haus and learned coffee-making and cocktail-shaking at Caravan, is an actor (at the time of writing, he was in a comic play at Richmond’s Orange Tree Theatre). Arthur Campbell’s background was in branding, Tasos Gaitanos is both photographer and chef (his family own several restaurants in Elounda, Greece; ‘he has cooking in his blood’, declares Large, proudly). By day, Brother Marcus offers the hipster holy trinity of brunch, cocktails and coffee. Plus street-side windows that open right up if it’s warm enough (it’s all terribly Brooklyn) and a cute courtyard out back. The food is mostly excellent, with ‘brunch’ translating to quality ingredients heaped onto toasted sourdough: pillowy scrambled eggs with smoked salmon, asparagus and chilli flakes, say. A flat white was smooth and mellow, a plate of fruit so fresh it warranted a slap. Only the lacklustre pastries got a big thumbs-down, but when I expressed concern, they said they’d already been thinking about switching supplier and would therefore ‘get right on it’. On weekend evenings, the cafe’s kitchen is turned over to one of their street food or supper club buddies (check Twitter/Facebook for details); during the week they close at 4.30pm and it becomes a space for the rest of their extended gang to hold events. One friend, recently back from Sri Lanka (obvs) is running yoga sessions there; another is due to start up an art class. As for the name, it’s how Large used to refer to his brother (‘Brother Marcus says we should do this’) and was always the cause of much LOL-ing among their group. (Brother) Marcus should be proud. Brunch for two with drinks and service: £30. Yum, yum, and yum again! Balham has so many great brunch spots, and Brother Marcus is up there with the best. The menu posed a problem, in that I couldn't decide which of the many delights to have. I ended up choosing the french toast made with crumpets and served with thick crispy bacon and caramelised banana. And it was a GOOD choice! Add to that good coffee (even if the cups are a bit on the small side) and friendly service, and you've got a winner. The food, coffee and decor don't deserve the 3* and even the staff were friendly enough however the service resulted in a rushed experience from start to finish. On arrival I was ushered over to the bar to wait for friends as they don't seat groups even with empty tables!! Then we were brought the bill after only just finishing our coffee and then asked to leave a few minutes later so they could free up our table (there were plenty of tables available in side!). Although our experience was tainted by the service the coffee was good, the food was delicious and it was presented beautifully. I recommend the crumpet French toast and the fritters. The outside space is lovely if you get the weather for it. I'll be back because the food was brill buuuut c'mon guys chill out! I popped in the other day having seen it scored highly in Time Out's list. I was disappointed that whilst they were prepared to make things to take away they indicated it would take long time. I was in a rush and they offered a bacon or sausage sandwich. I went for a bacon one, wasn't offered a choice of bread or sauce and wasn't asked if I wanted butter. I received a couple of tasty slices of bacon between slices of sourdough. It was a decent sandwich. But it wasn't cut in two and it was packaged in a box not a bag. These two things made it tricky to eat on the move. The lack of sauce meant it was a bit dull. There was no napkin provided - which I only realised when it was too late. I thought that was poor. I thought the menu looked fab and I will try and go back for a proper eat in meal - but the takeaway was disappointing. I want to give this place five stars but the mediocre service just brings it down a couple notches. My friends had to wait sometime for their drinks and my husband even got one on the house because there was a mixup in orders. The avocado smoothie I had was nice but the price was a bit much (£3.50) for a small glass. I ordered the Step Sister (courgette fritters) which comes as a cool stack topped with an egg (I had it scrambled) and yogurt and kale. It's very tasty and filling but a bit too salty. My husband got the Sugar Daddy pancakes and we agreed (after I had a bite of course!) that whilst the pancakes are nice and thick and the pecans appropriately sugary, the pancake should have been covered in syrup or more syrup provided to enhance the pancake flavour. My friends seemed to enjoy their food. Again, like I said, would give even higher stars if the service was better. We had to flag waiters down multiple times to get water as one example (why not just provide a jug for the table, duh). I also ordered each of the salads for takeaway and found out when I got home I was given two of the super salads (arghh). The salads are quite tasty though but very pungent with onion so be forewarned. Very cool brunch place in Balham. It all started with us queuing outside and Jeff being called in ahead of us...cue the 'HI JEFF' comments...we were then lucky enough to be sat right beside the man himself once inside sat in the lovely garden area. A refreshingly different king of brunch menu with quirky names for the dishes (don't worry avo on toast is still on there, just with feta and a few other delightful ingredients). 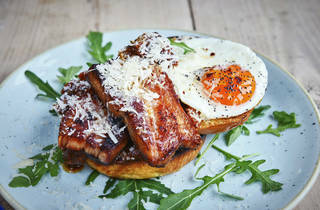 I went for the pork belly and egg on brioche bun dish, slightly verging onto lunch territory but it was well worth it. Definitely order the pork belly when you go, and you SHOULD go. I eagerly looked up their menu to check if they do evening dinner too. Sadly they don't at the moment but hopefully they will during the week soon! Terrific brunch venue. Relaxed atmosphere, super friendly staff and delicious food. I have also hosted a birthday drinks event at Brother Marcus and was very impressed - again the staff really went above and beyond to ensure the success of the evening. Highly recommended on both fronts. Great staff great food - the loaded buns are INCREDIBLE!! First time in Brother Marcus in Balham and am truly impressed. The food is of a high quality and tastes amazing. It's a plesent place for a quick bite and a chat with some nice music playing. The service is relaxed and friendly. Will be back for sure. Great venue. Three great lads that run it offering excellent food, coffee and cocktails. Super friendly staff and delicious breakfast options, I enjoyed the feta and beetroot fritters with a perfectly poached egg. Even sat on one of the tables outside in the rain (sheltered by a corrugated roof) it was the perfect start to a rainy Saturday morning. Thank you Bro! I love it because it's close to where I live, has fantastic brunch options including the most amazing French toast. The food is different, fresh & innovative. The coffee is well sourced & second to none. A true diamond of a cafe!! More a work of art than a coffee shop. Has to be experienced to be believed. A great place run by 3 great guys! Best cafe by a long shot! Perfect place to have a coffee, lunch, brunch or dinner! Great staff. Friendly staff who are always willing to have a chat, great food whether its breakfast, brunch, lunch or dinner. Open late for local craft beers on a Weds-Sat evenings. The best part is they are incredibly humble, unpretentious and in my opinion serve the best poached eggs and pour the smoothest flat white in Balham. Oh and they are buggy friendly! Best brunch in Balham, let down only by its coffee (which is sadly not great). Staff are all very friendly and to top it off, its dog-friendly! If they could perfect the coffee it would be five star plus. Great new breakfast place in Balham. The sister special is delicious and they make great coffee. Will definitely be visiting again! There's also a cute little courtyard out the back for a nice day.